When it comes to legal problems, there is no substitute for quality legal services. You need not face your difficult situation empty handed and unprepared. Instead, consult the dedicated attorneys at Duncan | Kent, PLLC. 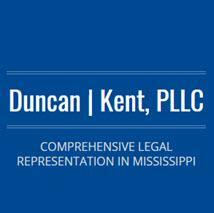 Our Mississippi law firm is focused on assisting clients with complex legal matters that can significantly affect their lives. In the areas of criminal defense, expungements, family law, immigration and personal injury, our lawyers provide effective and efficient results. Our services span throughout the Jackson metro area and beyond, including the west Tennessee cities of Memphis and Jackson. For our clients, the priority is helping them meet their needs and reach their goals. We are committed to seeking the best possible outcomes in any situation. Whether you have been injured in an accident, charged with a crime, are going through a divorce or need to help a family member gain legal entry into the country, you can benefit from our diverse legal experience. We are aggressive and ambitious in our pursuit to protect our clients' rights and obtain results. To schedule a free initial consultation, call our office toll free at 800-445-3564 or contact us online. Phone calls are returned promptly. We are conveniently located on Highway 51 in Ridgeland, Mississippi, just outside of the state capital. Evening and weekend appointments are available as needed.